A great data graphic can change the way we see the world. To demonstrate how creative and investigative—as well as illuminating—data science can be, we selected nine of the most fascinating data visualizations on the web. Get ready to gain new perspectives on everything from national spending, music, and creative routines to sports, dog breeds, and movies. Ten billion. Fifty billion. Sums this large can be difficult to conceptualize. That’s why McCandless analyzed spending and earning figures reported by the media and transformed them into simple squares set beside each other. 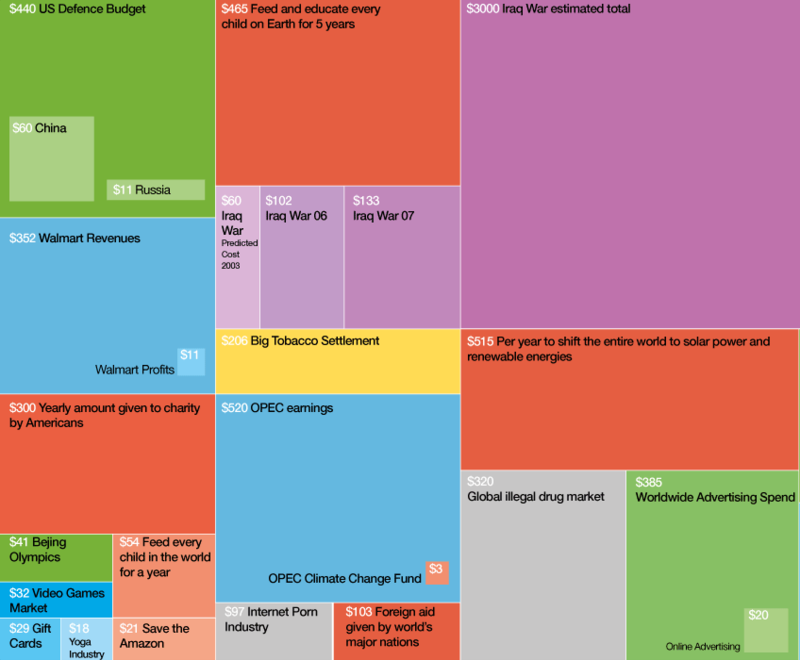 With this data visualization, you get a sense of size of billions spent, owned, or earned. 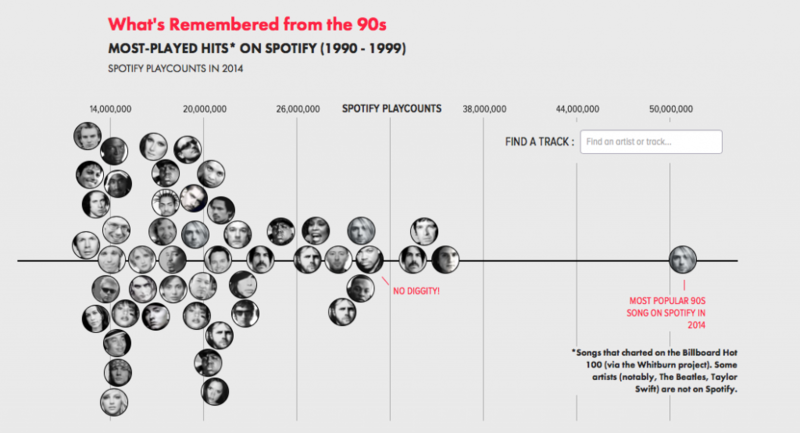 “No Diggity” is officially timeless, according to data scientists’ analysis of Spotify data. The research, which examined number of playcounts on the music-streaming site, resulted in a list of the most “timeless” songs from different decades. At 50 million playcounts, it’s not difficult to guess the landslide musical victor of the 90s. But what about earlier eras or the most-played rap hits? Does Daft Punk’s “Get Lucky” have the potential to become timeless? It’s all here in this interactive data visualization. Who knew that Darwin laid in bed for two hours at night solving problems? Or that Kafka wrote only at night, Maya Angelou worked in nondescript hotel rooms, and Victor Hugo always followed morning writing sessions with ice baths on the roof? We do, thanks to this graphic documenting how 26 great minds structured their days. 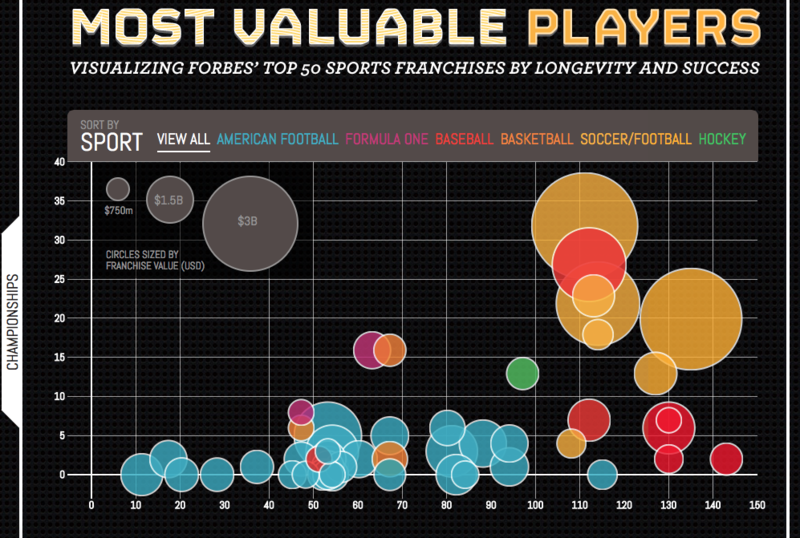 This data visualization examines the value of sports teams based on three factors: number of championship wins, longevity, and monetary worth. According to the data, the most valuable team is Real Madrid. The least valuable? Oakland Raiders. Let the feuding begin. 5. Which Canine Is Top Dog? Based on intelligence, longevity, ailments, and other factors, McCandless produced data scores for different dog breeds and plotted the scores against the popularity of the breeds. 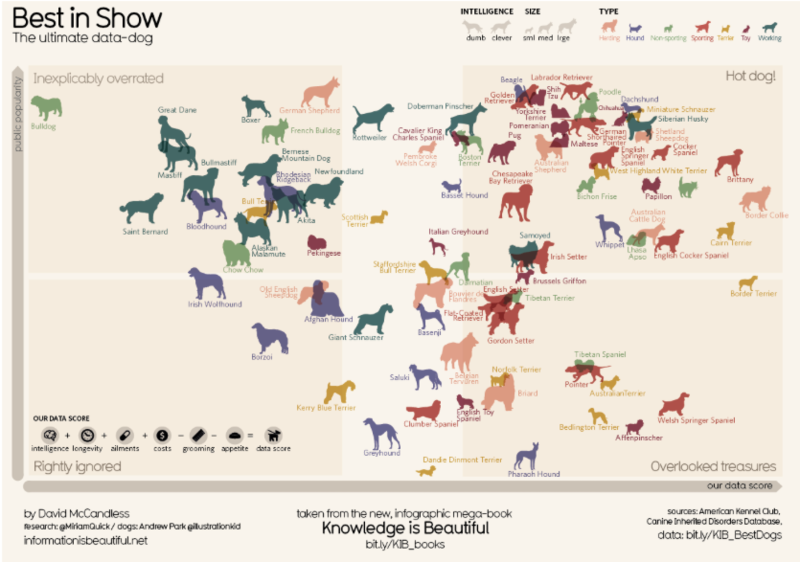 The resulting graph reveals overlooked treasures (the Welsh springer spaniel!) and the inexplicably overrated (the bulldog!). How did your pooch fare? The Y2K scare was nothing compared to global panic over swine flu and Ebola outbreaks, as shown in McCandless’s timeline of the world’s biggest fears and how the media amplifies them. When you dig into some of this data, things get really interesting. For example, fear of violent video games peaks every year in November and April. Why? McCandless shared his conclusion: Christmas video game releases create an upsurge in concern about the content. And in April 1999, the Columbine shooting happened, and some believe this was influenced by violent video games. Every year since, the media has reminded the public of this event in April. 7. Are Hollywood’s True Stories Really True? You’re sitting in a movie theater and see “based on a true story” appear on the screen. At the data level, what does that mean? Here are ten of Hollywood’s latest and greatest “true” stories, broken down scene-by-scene and analyzed for accuracy. Based on final percentages, The Big Short stayed closest to the truth and The Imitation Game took the most liberties with its source material. He also did a version featuring American fiction novels. 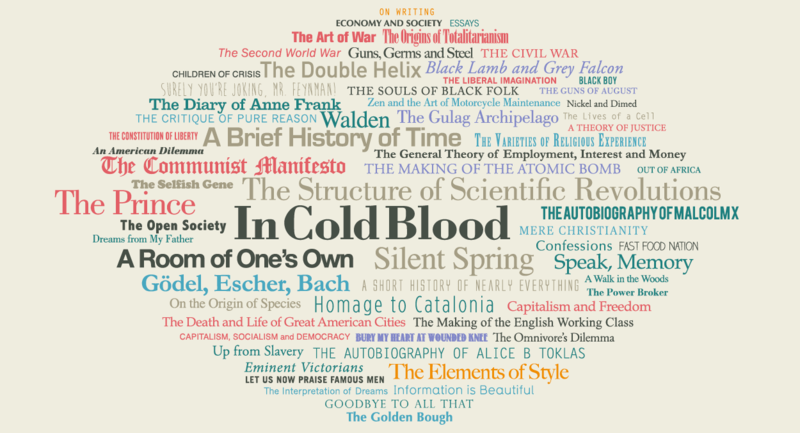 The author’s rule of thumb? 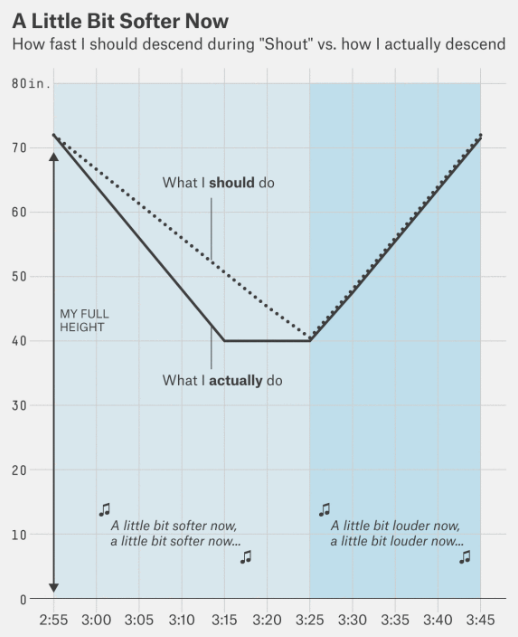 Take your height in feet and divide by three. That’s how many inches you should descend on every repetition. And yes, this may not change how you see the world—but it does change how the world sees you. You will thank us next time you go dancing and don’t pull a John Belushi. Wake up. Let the dog out. Drop the kids off at school. Work from nine to six. Pick the kids up from practice. Go to the gym. Get dinner on the table. Clean up. Their schoolwork. [Your schoolwork.] Orchestrate bedtime. Sleep. Repeat. Is earning a degree or certificate actually realistic for a fast-paced life like yours? Yes, absolutely. No matter what your daily schedule involves. Online learning through the University of Wisconsin Master of Science in Data Science program is convenient and flexible enough to fit even the busiest schedule. A simple Web interface makes it easy to access courses, connect with instructors and classmates, check your grades, and get support from student services when you need it. Clear course expectations help you stay on track and plan your studies around work and family life. Watch this video to discover six reasons why you will love learning about data science online through University of Wisconsin. If you’d like to find out more about online learning, visit the About Online Learning page of our website. Did you miss our free webinar on March 30? Worry not. You can view it here right now, or anytime! 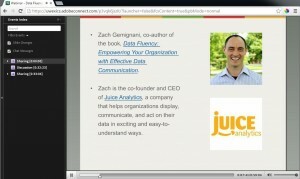 In this 60-minute webinar, University of Wisconsin Data Science Professor Lyna Matesi interviewed Zach Gemignani, co-author of the book, Data Fluency: Empowering Your Organization with Effective Data Communication. Zach is the co-founder and CEO of Juice Analytics, a company that helps organizations display, communicate, and act on their data in exciting and easy-to-understand ways. Zach and his brother, Chris, co-authored Data Fluency, which Dr. Matesi’s students use in her course, DS 735: Communicating About Data. What is the Data Fluency Framework, why it is useful, and what inspired it. Some important lessons Zack has learned from past mistakes in producing and sharing data products. How long it takes to build a data-fluent organization. Ways Zach has overcome cynicism about how data is presented. Which is more lucrative: taking a job as a data scientist or starting your own firm. View the recorded webinar now. Juice Analytics was founded in 2005 because brothers Zach and Chris saw a problem in the marketplace. Organizations were working hard to analyze and disseminate data, but they were not delivering the “last mile” in data visualization—where data actually creates better decisions. Juice Analytics is tackling this problem head on.